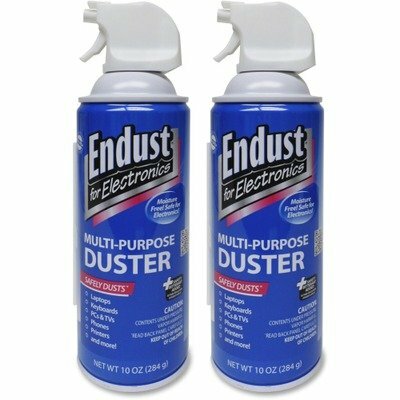 Endust for Electronics multi-purpose dusters are a great addition to any home or office! It blows away loose dust, loose dirt and lint (dust bunnies) from virtually any surface. Get the particles out of the cracks between your keyboards right away. This wonderful air duster also works for blowing dust off fake plants, sewing machines, printers, desktop towers, blinds, figurines, and much more. Please do as instructed and always use in the upright position, and in short blasts for the best results. This product does contain a bitterant to discourage abuse. NEVER use near a flammable source. Hold can upright (90 degrees) approximately 2” away from item to be cleaned. Pull trigger in a series of short blasts. To clean hard-to-reach areas, firmly insert extension tube into nozzle.